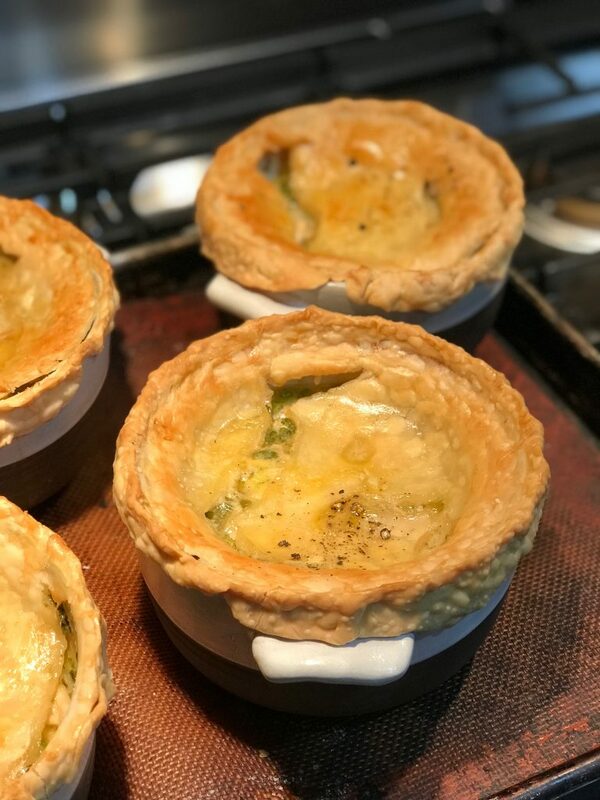 Chicken Pot Pie – Damn Life is Good! Pot pies are not only freakin’ delicious comfort food but also a super practical way to use up leftovers. Paul made a roast chicken Sunday with a lovely creamy Dijon sauce and I used the leftovers to make this super easy weeknight dinner (and lunches – it made a lot!) I sometimes make my own crust but used a Pillsbury store bought pastry this time. In a small saucepan, heat the chicken stock and dissolve the bouillon cubes in the stock. Add potatoes until ALMOST cooked. Then add carrots to soften – about 3 more minutes. In a large pot or Dutch oven, melt the butter and saute the onions and thyme over medium-low heat for 10 to 15 minutes, until translucent. Add the flour and cook over low heat, stirring constantly, for 2 minutes. Add the hot chicken stock to the sauce. Simmer over low heat for 1 more minute, stirring, until thick. Add 2 teaspoons salt, 1/2 teaspoon pepper, and heavy cream. Add the cubed chicken, carrots, peas, and parsley. Mix well. Pro Tip: You can add virtually any kind of veggie you have on hand – celery, green beans, squash, mushrooms, root vegetables! Divide the filling equally among 4 ovenproof bowls. Divide the dough into quarters and roll each piece into an 8-inch circle. Brush the outside edges of each bowl with the egg wash, then place the dough on top. Trim the circle to 1/2-inch larger than the top of the bowl. Crimp the dough to fold over the side, pressing it to make it stick. Brush the dough with egg wash and make 3 slits in the top. Sprinkle with sea salt and cracked pepper. Place on a baking sheet and bake for 1 hour, or until the top is golden brown and the filling is bubbling hot. Eat. Enjoy.